Wake Island (also known as Wake Atoll) is a coral atoll having a coastline of 12 miles (19.3 kilometers) in the North Pacific Ocean, formerly known as Halcyon Island, or Helsion Island atoll. It is located about two-thirds of the way from Honolulu, Hawaii (2,300 statute miles, 2,004 nautical miles, or 3,700 km west) to Guam (1,510 statute miles, 1,302 nautical miles, or 2,430 km east). Wake Island is actually an atoll comprising three islands, Wake, Wilkes, and Peale, surrounding a central lagoon, and is built upon a volcano. It is an unorganized, unincorporated territory of the United States, occupied under a caretaker permit from the U.S. Air Force, administered by the Office of Insular Affairs, U.S. Department of the Interior. Access to the island is restricted, and all current activities on the island are managed by the United States Air Force and Army. The Marshall Islands and U.S. governments have competing claims over the island, both of which are challenged by a separatist group of Marshall Island descendants who call themselves the Kingdom of EnenKio, citing "first-usage lands rights," a concept commonly held in Micronesian cultures. There has never been a settlement of an indigenous population on Wake Island, though lore has it that Marshall Islanders traveled to the atoll in search of seabirds and flowers for use in religious rituals. Rather, the human history of the atoll has for the most part been exclusive to military use. The island was of strategic importance in World War II, was the scene of a crucial meeting between U.S. President Harry S. Truman and General Douglas MacArthur in the early months of the Korean War, and served as a refugee camp for tens of thousands of Vietnamese refugees who fled their homeland after the fall of Saigon ended the Vietnam War. 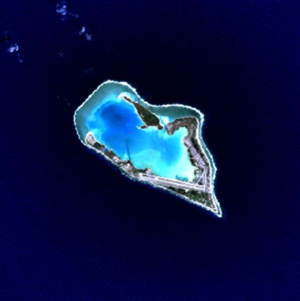 USGS Landsat 7 ETM+ satellite image of Wake Island. Wake Island is located to the west of the International Date Line and is one day ahead of the United States. Although Wake is officially called an island in the singular form, it is actually an atoll comprising three islands (Wake, Wilkes, and Peale) surrounding a central lagoon, and built upon a volcano. Referring to the atoll as an island is the result of a pre-World War II desire by the United States Navy to distinguish Wake from other atolls, most of which were Japanese territory. Wake Island lies in the tropical zone but is subject to periodic temperate storms during the winter. It receives little rainfall, averaging fewer than 40 inches per annum; two water catchments and a distillation plant for seawater provide necessary water for inhabitants. The wettest season is from July through October. There is no wide variation in temperature on the island - yearly maximum is 95 degrees °F; minimum, 68°F, with the mean monthly temperatures running from 76 to 83°F. Typhoons occasionally pass over the island. All operations on the island were suspended and the United States Air Force evacuated all 188 residents (mostly American and Thai contractors for the Department of Defense who worked at the civilian base) on two C-17 Globemaster planes as Super Typhoon Ioke(category 5) headed toward Wake on August 28, 2006. By August 31, the southwestern eyewall of the storm passed over the island, with winds of more than 165 mph (265 km/h), gusting up to 190 mph (306 km/h,) driving a storm surge and waves directly into the lagoon. Hurricane Ioke struck the island with sustained winds of 250 km/h and a 6 m storm surge inflicting major damage. A U.S. Air Force assessment and repair team returned to the island in September and restored limited function to the airfield and facilities, leading ultimately to a full return to normal operations. The surface of the three islands is a smooth roll of disintegrated coral, interspersed with boulders, most numerous on Wilkes and the southern leg of Wake Island, where they range to five or six feet in diameter. Trees, thick tropic shrub growth (often with thorns), and grasses are scattered through the islands and provide much opportunity for natural concealment. Vegetation is densest on the south leg of Wake Island, west and south of the airfield. 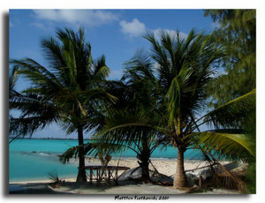 Trees sometimes reach a height of 20 to 25 feet, but the towering coconut palms found on most atolls are missing. The flightless Wake Island Rail was the island's only known nearly flightless ground-nesting shore/beachgrass landbird endemic to Wake Island. Last seen in the 1940s, it is believed to have became extinct when the Japanese garrison, cut off from resupply in 1944-1945, turned to hunting and fishing to avoid starvation. Some scant indigenous Marshallese oral tradition suggests that prior to European exploration, nearby Marshall Islanders traveled to what is now Wake Island, which the travelers called Enen-kio after a small orange shrub-flower (Kio) said to have been found on the atoll. In ancient Marshallese religion, rituals surrounding the tattooing of tribal chiefs, called Iroijlaplap, were done using certain fresh human bones, which required a human sacrifice. A man could save himself from being sacrificed if he obtained a wing bone from a certain very large seabird said to have existed on Enen-kio. Small groups would therefore brave traveling to the atoll in hope of obtaining and returning with this bone, for any man who completed the trip was rewarded; his life was spared and honor was bestowed by the chief. Based upon this oral tradition, along with concepts of first-usage lands rights claims commonly held in Micronesian cultures as legitimate for settling indigenous land disputes, a small separatist group of Marshall Island descendants who call themselves the Kingdom of EnenKio lay claim to Wake Island. 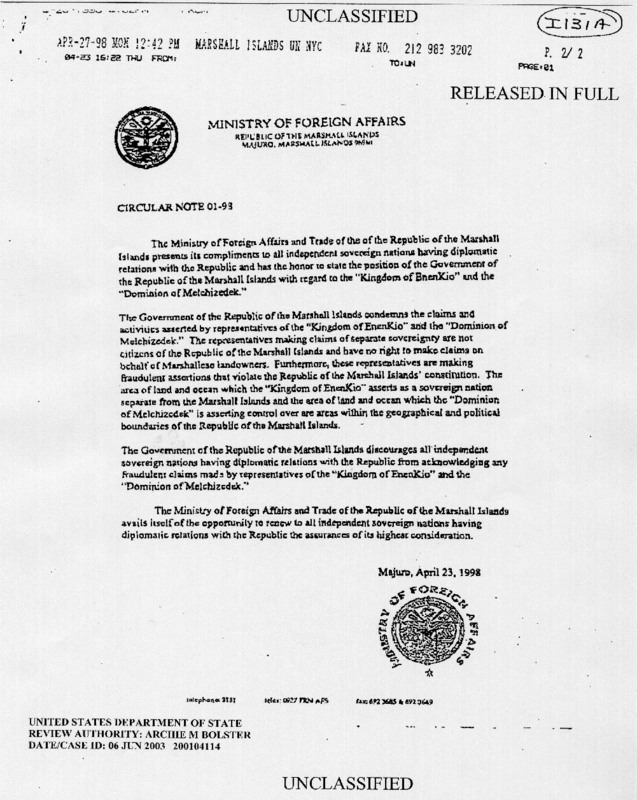 The Marshall Islands and U.S. governments, who also have competing claims over the island, vigorously deny the claim. No evidence suggests there was ever a permanent settlement of Marshall Islanders on Wake Island, for the land is too dry and not suitable for habitation. On October 20, 1568, Álvaro de Mendaña de Neyra, a Spanish explorer with two ships, Los Reyes and Todos Santos, discovered "a low barren island, judged to be eight leagues in circumference," to which he gave the name of "San Francisco." Originally searching to replenish their supplies of food and water, Mendaña fixed it accurately in latitude and very badly in longitude, placing it east of the Hawaiian group. The island was eventually named for Captain Samuel Wake, master of the British trading schooner, Prince William Henry, who visited in 1796. On December 20, 1840, the United States Exploring Expedition commanded by Commodore Charles Wilkes of the U.S. Navy, landed on and surveyed Wake. 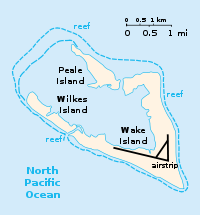 Wilkes described the atoll as "a low coral one, of triangular form and eight feet above the surface. It has a large lagoon in the centre, which was well filled with fish of a variety of species among these were some fine mullet." He also noted that Wake had no fresh water and that it was covered with shrubs, "the most abundant of which was the tournefortia" (or tree heliotrope). The expedition's naturalist, Titian Peale, collected many new specimens, including an egg from a short-tailed albatross and various marine life specimens. Wake Island first received international attention with the wreck of the Libelle. On the night of March 4, 1866, the barque Libelle of Bremen, Germany, struck the eastern reef of Wake Island during a gale. The ship was under the command of Captain Tobias and en route from San Francisco, California to Hong Kong, with a cargo of over $300,000. Among its passengers were opera singer Anna Bishop (ex-wife of the celebrated French harpist,) her husband Martin Schultz (a New York diamond merchant), and three other members of an English opera troupe. After 23 days, the 30 stranded passengers and crew set sail in a 22-foot longboat and a gig for the then Spanish island of Guam. The longboat, containing the opera troupe, Mr. Schultz and other passengers, arrived on Guam 18 days later. A second 20 foot longboat, commanded by the Libelle’s captain, was lost at sea. Once aware of their disappearance, a schooner was sent out in search of the vessel. While stranded on Wake Island, Captain Tobias had buried valuable cargo including 1,000 flasks (34,500 kg) of mercury, coins and precious stones worth approximately $145,000, and at least five ships conducted salvage operations in their recovery. The plight of the Libelle, its passengers and cargo was reported by many newspapers. Wake Island was annexed by the United States (empty territory) on January 17, 1899. In 1935, Pan American Airways constructed a small village, nicknamed "PAAville," to service flights on its U.S.-China clipper route. The village was the first human settlement on the island and relied upon the U.S. mainland for its food and water supplies; it remained in operation up to the day of the first Japanese air raid in World War II. In January 1941, as war with Japan loomed, the United States Navy constructed a military base on the atoll. On August 19, the first permanent military garrison, elements of the 1st Marine Defense Battalion  and Marine Fighting Squadron (VMF) 211, totaling 449 officers and men, were stationed on the island, commanded by Commander Winfield Scott Cunningham. Others on the island were 71 sailors, a six-man Army signal detachment and about 1,221 civilian workers. They were armed with six used 5 inch (127 mm) cannons, removed from a scrapped cruiser; twelve 3 inch (76.2 mm) M3 anti-aircraft guns (with only a single working anti-aircraft sight among them); 18 Browning M2 heavy machine guns; and 30 heavy, medium, and light, water- or air-cooled machine guns in various conditions but all operational. The surrender of the Japanese garrison on Wake Island - September 4, 1945. Shigematsu Sakaibara is the Japanese officer in the right-foreground. On December 8, 1941, within minutes of the Attack on Pearl Harbor (Wake being on the opposite side of the International Date Line), 34 Japanese medium "Nell" bombers flown from bases on Truk in the Caroline Island group attacked Wake Island, destroying seven of the twelve F4F Wildcat fighter aircraft belonging to a Marine Corps fighter squadron VMF-211 on the ground, delivered just days earlier aboard the USS Enterprise CV-6. Even though Wake Island and Peale received numerous bomb salvos, all of the Marine garrison's defensive emplacements were left intact by the raid, which primarily targeted the naval aircraft. The garrison, supplemented by civilian volunteers, repelled several Japanese landing attempts. An American journalist reported that after the initial Japanese amphibious assault was beaten back with heavy losses, the American commander was asked by his superiors if he needed anything, to which the commander sent back the message "Send us more Japs!," a reply which became a popular legend. However, when Major Deveraux learned after the war that he was credited with that message he pointed out that he was not the commander, contrary to the reports, and denied sending that message: "As far as I know, it wasn't sent at all. None of us was that much of a damn fool. We already had more Japs than we could handle." The bombing raids - launched from Roi, in the Kwajalein atoll some 700 miles south - continued for the next three days, taking their toll on the island's defenders, and grinding the Marine's fighter squadron down to four flyable planes. With these planes, six 5-inch and twelve 3-inch anti-aircraft guns, the Marines greeted the Japanese landing force that appeared early December 11. Despite this defiant spirit, the garrison was eventually overwhelmed by the determined and numerically superior Japanese invasion force. They were captured and most were shipped to China, while 98 men were left on Wake to construct defenses for the Japanese. American casualties were 52 military personnel killed, along with approximately 70 civilians. Japanese losses exceeded 700 killed, with some estimates ranging as high as 900; in addition, the Japanese lost four destroyers and 20 aircraft, which much of the remnants can be found along the coastline and scattered about the island. In the aftermath of the battle, some of the captured civilian laborers were pressed into service by the Japanese and tasked with improving the island's defenses. After a successful American air raid on October 5, 1943, the Japanese garrison commander Rear Admiral Shigematsu Sakaibara ordered the execution of the 98 prisoners on the pretext that they were spies. One prisoner escaped the mass execution, but was later personally beheaded by Sakaibara. After the war, Sakaibaira was tried for war crimes, found guilty, and executed by hanging at Guam in 1947; his subordinate was sentenced to life in prison. Captain Henry T. Elrod, one of the pilots from VMF-211, was awarded the United States Medal of Honor posthumously for shooting down two out of twenty-two Japanese Zero fighters, executing repeated bombing and strafing runs at extremely low altitude and close range, succeeded in inflicting deadly damage upon a large Japanese vessel, thereby sinking the first major warship to be destroyed by small caliber bombs delivered form a fighter-type aircraft. Many of his comrades were also highly decorated for their roles in the fighting. 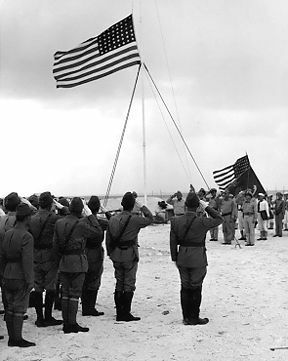 The Wake Island Device was created for American veterans of the battle. The Japanese-occupied island was bombed several times by American air forces; one of these raids was the first mission for future United States President George H. W. Bush. On July 25, 1944, Bush and another pilot received credit for sinking a small cargo ship. On September 4, 1945, the remaining Japanese garrison surrendered to a detachment of the United States Marine Corps. In a brief ceremony, the handover of Wake was officially conducted. On October 14, 1950, the island served as a one-day meeting site between General Douglas MacArthur and U.S. President Harry S. Truman, who met to discuss strategy for the Korean War that had broken out four months earlier. The meeting became famous partly because MacArthur unintentionally failed to salute his commander-in-chief when greeting him, and partly because MacArthur minimized the chances for Chinese intervention in the war (they began to intervene later that month). It was the only time the two ever met, and Truman agreed to convene on Wake Island because MacArthur insisted that Honolulu was too far away from his Tokyo headquarters and the Korean battlefront, despite the fact that Truman had to travel from Washington, D.C. Truman felt he needed to meet MacArthur to improve the Democrats' chances in the mid-term congressional elections in November. Historians who have analyzed a stenographic transcript of the meeting as well as participants' recollections conclude that this unique meeting stood out because of woefully inadequate preparation by the Truman administration; better preparation for the strategic and political implications of the meeting could have better prepared the U.S. for China's massive intervention in the Korean War. Interestingly, in their private meeting at Wake, Truman, who was eligible for re-election, asked MacArthur (a Republican) if he had any plans for the 1952 presidential election. Since 1974, the island's airstrip has been used by the U.S. military and some commercial cargo planes, as well as for emergency landings. There are over 700 landings a year on the island. There are also two offshore anchorages for large ships. On September 16, 1985, the World War II-related resources on Peale, Wilkes, and Wake Islands were designated a National Historic Landmark, and thereby also listed on the National Register of Historic Places. The United States military personnel have left, and there are no indigenous inhabitants. Wake, with an undelineated maritime boundary with them, is claimed by the Marshall Islands, and some civilian personnel ("contractor inhabitants") remain. As of August 2006, an estimated 200 contractor personnel were present. The island remains a strategic location in the North Pacific Ocean and serves as an emergency landing location for transpacific flights. Many historic World War II facilities remain, the most significant being the "98 rock," a large piece of coral standing in the lagoon inscribed "98/U.S./P.W/5-10-43," a message carved by one of the 98 POW's later executed on Wake Island. Other significant remains include the U.S. Marine Corps command post and hospital bunkers, the Japanese command post bunker, and numerous Japanese pillboxes, fighting positions, tank traps and aircraft revetments. Only one artillery piece remains; an 8-inch British–made gun captured by the Japanese in Singapore and relocated to Wake Island. Ruins of the partially completed U.S. Naval Air Station also remain on Peale Island. Subsequently the island was used for strategic defense and operations during the Cold War. It was administered by the United States Army Space and Missile Defense Command (formerly known as the United States Army Space and Strategic Defense Command prior to October 1, 1997). Since 1974, from Wake Island, military rockets were launched on the island for the test of anti-missile systems and for atmospheric re-entry tests. From late April until the middle of August 1975, Wake Island was used as a refugee camp, temporary residence and processing center for tens of thousands of Vietnamese refugees who fled their homeland after the fall of Saigon ended the Vietnam War. The territorial claim by the Republic of the Marshall Islands on Wake Atoll leaves a certain amount of ambiguity regarding the actual or hypothetical role of the U.S. military, responsible under agreement for the defense of Marshallese territory, in the event of any strategic crisis or hostilities involving Wake. However, the atoll was formally annexed by the U.S., and is still administered by the U.S. Department of the Interior. ↑ Wake Island has no indigenous inhabitants but approximately 150 military personnel and civilian contractors maintain and operate the airfield and communications facilities. Central Intelligence Agency, Wake Island The World Factbook. Retrieved January 20, 2012. ↑ Super Typhoon Slams Tiny Wake Island, September 01, 2006, FoxNews.com. Retrieved June 28, 2007. ↑ Monster Typhoon Ioke Makes Direct Hit on Wake Island, Aug. 31, 2006, NewsVOA.com. Retrieved June 28, 2007. ↑ Wake Island, DOI Office of Insular Affairs. Retrieved June 22, 2007. ↑ Kio Island, Office of Terrestrial Affairs. Retrieved June 28, 2007. ↑ Introduction to a Pacific Island Sanctuary, EnenKio Introduction. Retrieved June 28, 2007. ↑ Circular Note 01-98 Ministry of Foreign Affairs. Retrieved June 28, 2007. ↑ Welcome Wake Island Welcome Wake Island. Retrieved June 28, 2007. ↑ Nicolas Bochsa. (in French) Retrieved August 27, 2008. ↑ Condition Red: Marine Defense Battalions in World War II, Marines in World War II, Retrieved July 8, 2007. ↑ Battle of Wake Island: 1941, Olive Drab. Retrieved July 8, 2007. ↑ Marine Corps Legends, About.com. Retrieved June 29, 2007. ↑ Paul F. Boller, Jr. and John George. They Never Said It: A Book of Fake Quotes, Misquotes, and Misleading Attributions. (New York: Oxford University Press, 1989 ISBN 0195055411), 20. ↑ Wake Island, USS Enterprise CV-6 The Most Decorated Ship of the Second World War. Retrieved June 27, 2007. ↑ Medal of Honor - Capt. Henry T. Elrod, Capt. Henry T. Elrod - Medal of Honor, 1941, VMF-211, Wake Island. Retrieved July 15, 2007. ↑ Wake Island during WWII, Information and history of Wake Island. Retrieved July 15, 2007. ↑ CIA - The World Factbook CIA - The World Factbook. Retrieved July 15, 2007. Heine, Dwight, and Jon A. Anderson.Enen-kio: Island of the Kio Flower. Micronesia Reporter, 1971. Heinl, Lieutenant Colonel R.D. February 13, 1998. United States Marine Corps historical monograph - The Defense of Wake. ibiblio. Mayy 23, 1996. Surrender of Wake by the Japanese. ibiblio. Wake Island. U.S. Army Space & Missile Defense Command. Wake Atoll. Pacific Wreck Database. "Wake Island" (1942). Internet Movie Database. "Wake Island: Alamo of the Pacific" (2003). Internet Movie Database. Wake Island. CIA - The World Factbook. The Wreck of the Libelle. Marshalls Digital Micronesia. About Wake Island. Wake Island 1975: Photos of Vietnam Refugees on Wake Island in 1975. This page was last modified on 14 October 2016, at 20:02.